In a thick bottomed kadai (frying pan), put one or two tablespoon ghee and fry the carrot gratings till it’s raw smell goes away. Fry the cashew nuts also in a little ghee and keep aside. Melt sugar in sufficient water (for 1 cup sugar, ¼ cup water is sufficient) till it reaches one string consistency. Add the carrot to this and stir well. Add ghee now and then, till the mixture leaves the sides of the vessel. Add fried cashew nuts and powdered cardamom to this. Mix well and pour it in a greased plate. Cut into desired shape. 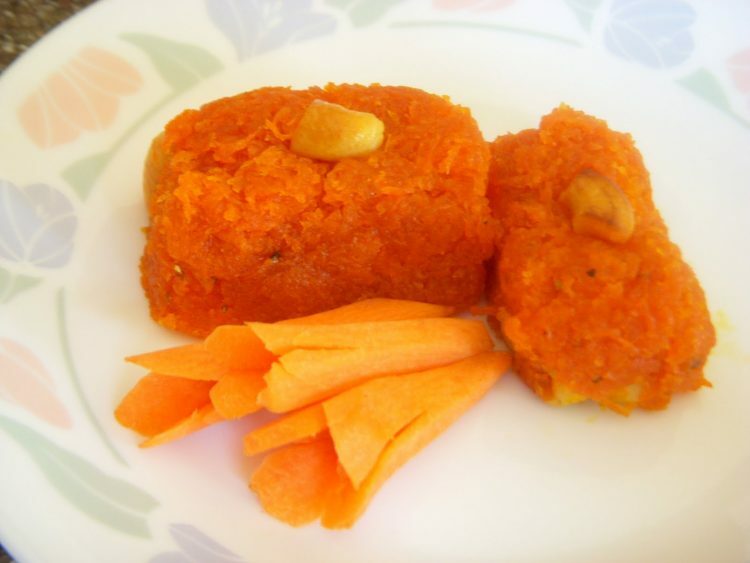 Note:For one big carrot, you will get one to one and half cup fine grating and four pieces of carrot burfi. For the above quantity you will get 8 to 10 small pieces. when we know that it is time to pour it into a greased plate? any specific consistency needs to be looked for? can u answer immediately since I am trying to make it today for a few guests! Yes. The carrot mixture will be like a big ball and will not stick into your fingers when you touch it and easily leaves the sides of the vessel. Actually it is like a dough and you can spread it using a spatula. Best wishes for making this burfi and let me know the result. This burfi was divine. You can see the results here. It is wonderful. I will try with less sugar too. The picture in your blog is so perfect. Welcome to our site Brinda Chengappa. To get the right consistency for burfi, you have to cook little more than halwa stage.